What a weekend! The end of the inaugural season of the Tudor United Sports Car Championship ended on a high note for Porsche. After a strong start to the season with wins at both Daytona and Sebring, the new Porsche factory team and the 991 based RSR seemed to flounder. From mechanical issues, to team issues, to bad officiating, the season never really felt as close as it was. Regardless, with just one race left, Porsche was in a fight for the Manufacturer Championship in the GTLM class. They won that fight on Saturday thanks to a GTLM victory by Team Falken Tire and a second place finish by the Porsche factory #912. If you missed the race The FOX Network will broadcast a two-hour highlight show of yesterday’s Petit Le Mans today, Sunday, October 5. Check local listings for times. Porsche's full race report, season results and other interesting news can be found after the gallery below. Click on any image to view a larger version. When you're done viewing images in the gallery click the "X" in the top left corner to return to the post. 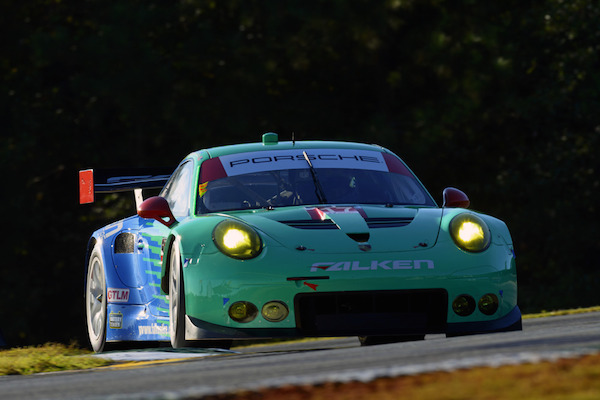 On the shoulders of Team Falken Tire’s second-consecutive Petit Le Mans GT Le Mans (GTLM) class victory, Porsche secured multiple manufacturer championships today at Road Atlanta in the inaugural season of the TUDOR United SportsCar Championship. Using the seventh-generation Porsche 911 as its base, race versions of the iconic rear-engine sports car won the GTLM Manufacturer Championship with the Porsche 911 RSR while the Porsche 911 GT America took the same honor in the GT Daytona (GTD) class. Porsche North America, the official TUDOR Championship factory team, earned GTLM class pole position for Saturday’s race and finished second and fifth behind the privately entered Falken Tire machine in the 10-hour endurance classic. The German marque added to its cadre of endurance accolades by earning the hard-fought Tequila Patrón North American Endurance Championship Manufacturer Trophy as well. Following victories in the first two endurance races of the inaugural TUDOR Championship season at the Rolex 24 At Daytona and the Mobil 1 Twelve Hours of Sebring, Porsche entered today’s final round of the championship with a slight lead. After the No. 912 Porsche North America Porsche 911 RSR led today’s race at the four-hour mark, and the No. 17 Team Falken Tire Porsche was on point at eight-hours, the GT racing legend was able to lock the Manufacturer award even before the final checkered flag of the season fell. The race victory and championships were a fitting tribute to longtime Porsche Motorsport head Hartmut Kristen. Kristen passed the baton of overseeing all of Porsche’s GT efforts to Dr. Frank Walliser on October 1. 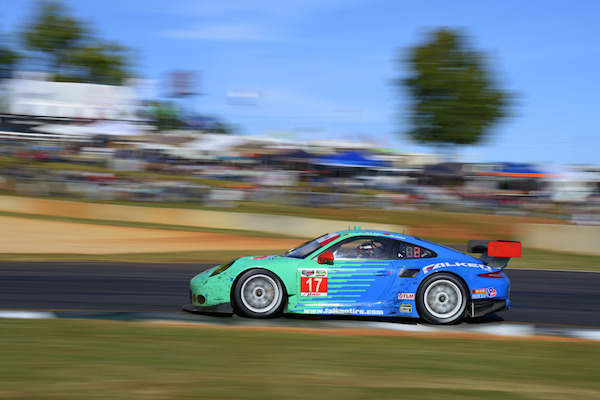 For the second-consecutive season, Team Falken Tire overcame the odds to win top GT class honors at the Petit Le Mans. The full-season driver pairing of local Braselton, Georgia driver Bryan Sellers and Wolf Henzler (Germany) were joined by German Marco Holzer for the finale of the inaugural season of the TUDOR Championship. 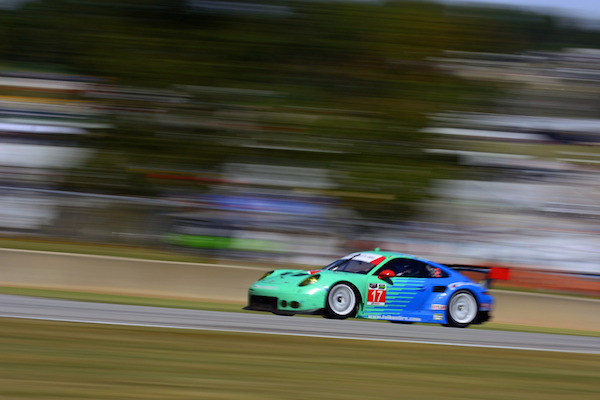 Team Falken Tire, the only customer-run Porsche 911 RSR competing in the North American-based series, was fast throughout the weekend and led much of the day. With less than an hour to go, Sellers turned over the Falken Tire Porsche to Henzler who held the lead against the also fast No. 912 Porsche North America Porsche 911 RSR of Michael Christensen (Denmark). The battle tightened even further with less that 20-minutes remaining when an accident slowed the field for an extended yellow flag. The green flew again with six minutes to go taking the fight to the end. The works Porsche closed but, threatened by a Dodge Viper SRT from behind, was not able to pass Henzler. The three main players in the Manufacturer’s Championship passed under the checkered flag less than two-seconds apart after ten-hours of racing. The No. 17 Porsche 911 RSR led the No. 912 shared by Christensen, Patrick Long (Playa del Rey, California) and GTLM newcomer Earl Bamber (New Zealand) followed by the No. 91 Viper. The pole-position winning No. 911 Porsche North America Porsche 911 RSR of Nick Tandy (Great Britain), Patrick Pilet (France) and Jörg Bergmeister (Germany) ran at the front most of the day. However, a pit lane incident, which damaged several of the GTLM leaders to varying degrees, forced the car to make multiple stops for repairs. The Rolex 24-winning class entry finished fifth as a result. The eight Porsche 911 GT America racecars entered in the GT Daytona class for Road Atlanta were not only hoping for a top finish, but several teams were competing for driver and team titles. Everyone contributed in helping Porsche win the Manufacturer Championship. The No. 58 Snow Racing Porsche 911 GT America took on Petit Le Mans with only two drivers – Madison Snow (Lehi, Utah) and Jan Heylen (Tampa, Florida) – but they were fastest in two of the three practice sessions and led GTD for most of the first four hours. Through a series of pit stops and a stuck wheel during a tire change, they fell out of the top three, but ended the race in second place, just behind the winning Audi R8. That finish was high enough to secure the GTD class Manufacturer Championship for Porsche. Also finishing on the GTD Petit Le Mans podium was the No. 44 Magnus Racing Porsche of John Potter (Salt Lake City, Utah), Andy Lally (Dacula, Georgia) and Marco Seefried (Germany). It was the team’s fifth podium of the year. The No. 23 Alex Job Racing Porsche with Alex Riberas (Spain), Ian James (Phoenix, Arizona) and Mario Farnbacher (Germany) was headed for a podium as well, but a last-lap incident with the class-winning Audi sent the Porsche off the track only hundreds of yards from the finish, relegating them to a fifth place finish. The No. 22 Alex Job Racing Porsche, driven by Leh Keen (Atlanta, Georgia), Cooper MacNeil (Hindsdale, Illinois) and Craig Stanton (Long Beach, California), needed to finish ahead of the No. 94 BMW for a shot at the driver championship. They fell a lap back when they had to recycle their electronics in the pits and were never able to get back with the leaders. An eighth-place finish gave them third in the driver championship – the best finishing Porsche drivers in GTD. It Rained Before The GT3 Cup Challenge This Weekend. What Happens As A Result Is Wild!